From the guidelines: "People do not need to wait for permission to log your EarthCache. Requiring someone to wait is not supported by the EarthCache guidelines. People should send their logging task answers to you, then log your EarthCache. 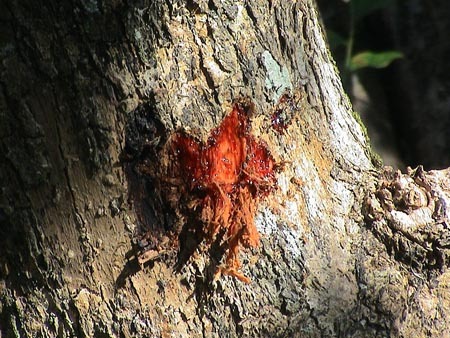 When you review their logging task answers, if there is a problem, you should contact them to resolve it. If there is no problem, then their log simply stands." Seychelles, officially the Republic of Seychelles is an archipelago nation of 115 islands in the Indian Ocean, some 1,500 kilometre east of mainland Africa, northeast of the island of Madagascar. Other nearby island countries and territories include Zanzibar to the west, Mauritius and Réunion to the south, Comoros and Mayotte to the southwest, and the Suvadives of the Maldives to the northeast. Seychelles has the smallest population of any state in Africa. 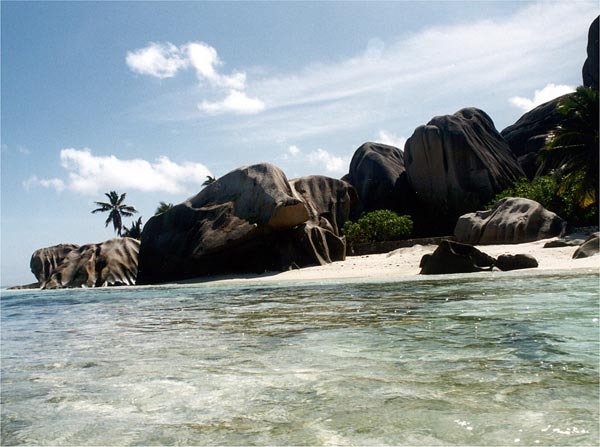 An island nation, the Seychelles is located to the northeast of Madagascar and about 1,600 km (1,000 mi) east of Kenya. 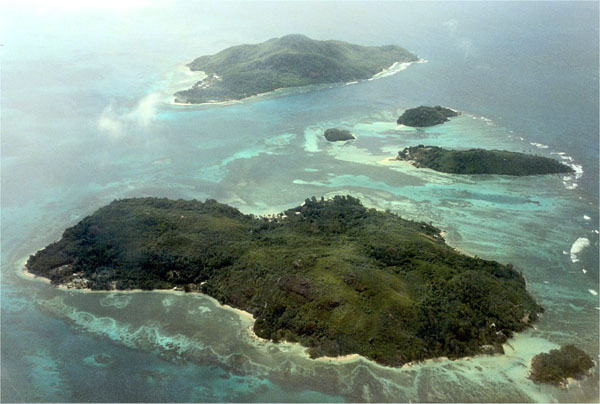 The number of islands in the archipelago is often given as 115 but the Constitution of the Republic of Seychelles lists 155. The islands as per the Constitution are divided into various groups as follows. There are 42 granitic islands, in descending order of size: Mahé, Praslin, Silhouette, La Digue, Curieuse, Félicité, Frégate, St. Anne, North, Cerf, Marianne, Grand Soeur,Thérèse, Aride, Conception,Petite Soeur, Cousin, Cousine, Long, Récif, Round (Praslin), Anonyme, Mamelles, Moyenne, Ile aux Vaches Marines, L'Islette, Beacon (Ile Sèche), Cachée, Cocos, Round (Mahé), L'Ilot Frégate, Booby, Chauve Souris (Mahé),Chauve Souris (Praslin), Ile La Fouche, Hodoul, L'Ilot, Rat, Souris, St. Pierre (Praslin),Zavé, Harrison Rocks (Grand Rocher). There are two coral sand cays north of the granitics: Denis, Bird. There are two coral islands south of the granitics: Coëtivy, Platte. 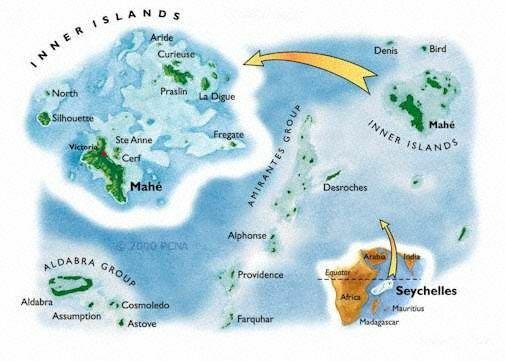 There are 29 coral islands in the Amirantes group, west of the granitics: Desroches, Poivre Atoll (comprising 3 islands : Poivre, Florentin and South Island), Alphonse, D'Arros, St. Joseph Atoll (comprising 14 islands: St. Joseph Ile aux Fouquets, Ressource, Petit Carcassaye, Grand Carcassaye, Benjamin, Bancs Ferrari, Chiens, Pélicans, Vars, Ile Paul, Banc de Sable, Banc aux Cocos and Ile aux Poules), Marie Louise, Desnoeufs, African Banks (comprising 2 islands: African Banks and South Island), Rémire, St. François, Boudeuse, Etoile, Bijoutier. There are 13 coral islands in the Farquhar Group, south-south west of the Amirantes: Farquhar Atoll (comprising 10 islands: Bancs de Sable Déposés Ile aux Goëlettes Lapins Ile du Milieu North Manaha South Manaha Middle Manaha North Island and South Island), Providence Atoll (comprising two islands: Providence and Bancs Providence) and St Pierre. 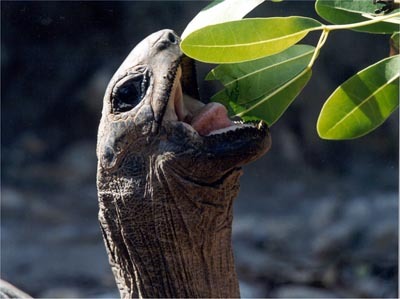 There are 67 raised coral islands in the Aldabra Group, west of the Farquhar Group: Aldabra Atoll (comprising 46 islands: Grande Terre, Picard, Polymnie, Malabar, Ile Michel, Ile Esprit, Ile aux Moustiques, Ilot Parc, Ilot Emile, Ilot Yangue, Ilot Magnan, Ile Lanier, Champignon des Os, Euphrate, Grand Mentor, Grand Ilot, Gros Ilot Gionnet, Gros Ilot Sésame, Heron Rock, Hide Island, Ile aux Aigrettes, Ile aux Cèdres, Iles Chalands, Ile Fangame, Ile Héron, Ile Michel, Ile Squacco, Ile Sylvestre, Ile Verte, Ilot Déder, Ilot du Sud, Ilot du Milieu, Ilot du Nord, Ilot Dubois, Ilot Macoa, Ilot Marquoix, Ilots Niçois, Ilot Salade, Middle Row Island, Noddy Rock, North Row Island, Petit Mentor, Petit Mentor Endans, Petits Ilots, Pink Rock and Table Ronde), Assumption, Astove and Cosmoledo Atoll (comprising 19 islands: Menai, Ile du Nord (West North), Ile Nord-Est (East North), Ile du Trou, Goëlettes, Grand Polyte, Petit Polyte, Grand Ile (Wizard), Pagode, Ile du Sud-Ouest (South), Ile aux Moustiques, Ile Baleine, Ile aux Chauve-Souris, Ile aux Macaques, Ile aux Rats, Ile du Nord-Ouest, Ile Observation, Ile Sud-Est and Ilot la Croix). The Seychelles, along with Madagascar, were displaced in a northeasterly direction away from the African landmass during the early formation, in the Jurassic, of the Indian Ocean. As such, 42 of the 116 islands comprising the Seychelles Archipelago are the world's only mid-ocean islands composed of granitic rocks. Grey and pink amphibolitic granite, of late Precambrian age, is spectacularly displayed on the northern island of La Digue and at Mahe. 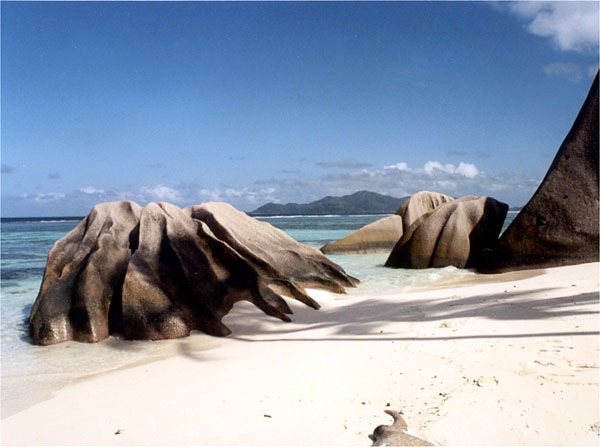 The islands of Seychelles can be categorised, geologically, into three main types. Firstly, the high granitic islands including Mahe, Praslin and La Digue and their associated assemblage, comprising in all, fourty one islands. Secondly, to the south-west of Mahe the low sand cays 011 coral reefs forming the Amirantes group, and finally, situated even further to the south-west, the slightly more elevated, limestone islands of the Aldabra-Astove group(2). 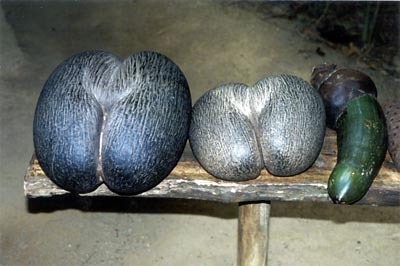 The dominant rock type on Mahe is an alkali granite containing microperthite, which is commonly sericitized, oligoclase, and quartz. Some quartz grains are glassy and slightly smokey, tending to occur as irregular aggregates. Mafic minerals are sometimes sparse but include fine granular aggregates of a fibrous amphibole with a deep green colour and strong pleochroism. Some varieties of the granite contain biotite, with sphene and apatite as the common accessories. Figure 4.0 presents a summary of the geology of the main granitic islands of the Seychelles. The area of calcareous sands situated in the north-west of Mahe corresponds to the coastal plain of Beau Vallon. In the north-western outcrops on Mahe around Northholme (on the northern boundary of the study site) there are a number of zones of flow-aligned xenoliths, which are amphibole rich and of dioritic appinitic or gabbroic composition. These are associated with tonalite, adamellite or granodioritic hybrid rocks and north of Beau Yallon occur in swarms with large (up to I Sm.) gabbroic relics of horneblende diorite(l). 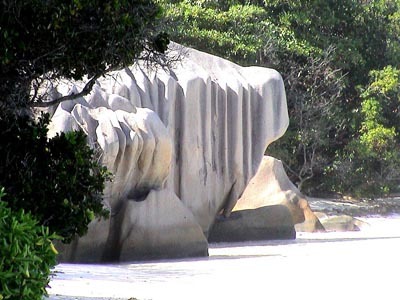 The granitic rocks of Mahe have been dated to around 650 million years old. These granites are intruded in places by much younger basaltic dykes (c. 50 million years old) chemically similar to oceanic basalt. The pockets of 'red earth' common in the areas behind the coastal plain at Beau Vallon are a direct result of the weathering of the exposed granite surfaces. On the higher slopes depressions are filled with red laterite and pale brown kaolinitic clays. There is little doubt that these products of extensive weathering are not solely the result of the present erosion cycle. The flutted surface on the granites extend well below sea-level and geophysical investigations show the granite to lie 30 metres or more below the reef-flats in some areas. These lines of evidence strongly suggest that the surface morphology of the granite was defined when sea-level was appreciably lower. La Digue Island has long been known for its world-class resorts featuring tropical flora, white-sand beaches, swimming in crystal clear waters, snorkeling among coral reefs and magnificent scenic views. 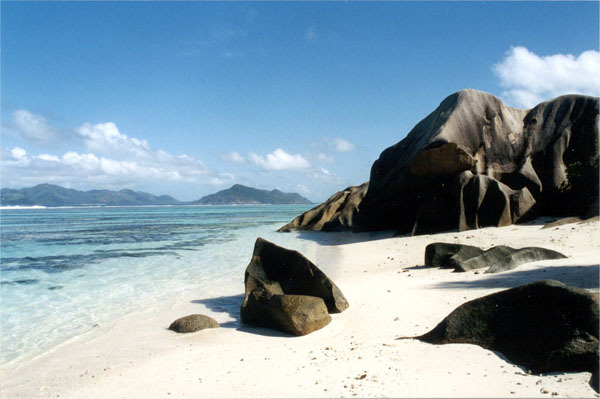 Anse source d'argent beach, located on the island, is the site of several tors although tors are a common feature of the granitic group of islands. The word 'tor'; Celtic in origin, is used generally in the British Isles to denote a rather tall rock column. Its use as a scientific terms was first proposed in 1955 to describe the tors at Dartmoor, Devonshire, England, now considered the type area for the feature. Early hypotheses for the origin of tors invoked deep weathering along joint planes in granite, with subsequent removal of the loose material leaving exposed columns. Alternate possibilities include differential erosion during scarp recession and relict subaerial prominences formed in the Tertiary. Since tors have been found worldwide, often in granite but also in other igneous, sedimentary, and metamorphic rocks it is not possible to offer a definition that will encompass the many landforms to which the name 'tor' has been given. 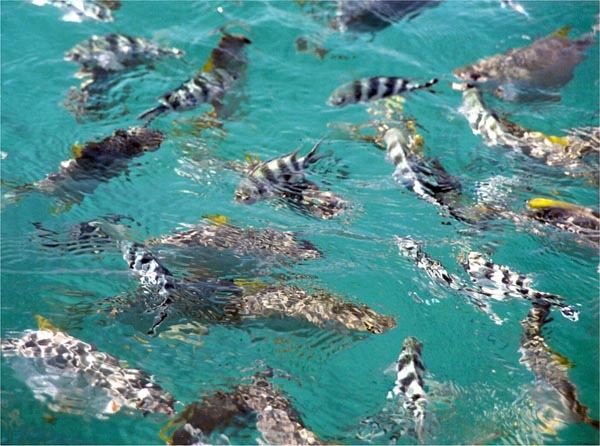 With such wide distribution and varied lithology it is arguable that the most scenic among all of these are coastal tors, as can be seen in the Seychelles and Virgin Islands. 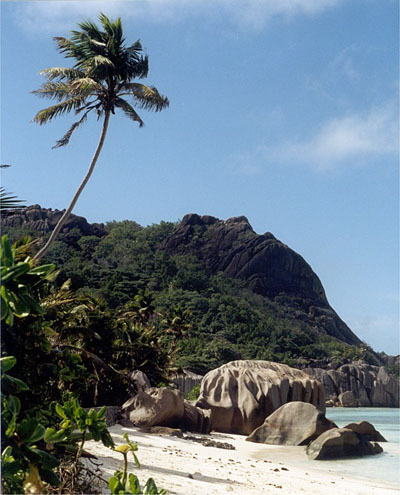 The EarthCache Ground zero is located on Anse source D'argent on the Island of La Digue with its myriad tors. 1- What colour is the large tor at this location? 3- Estimate the height of the tor at this location. Please e-mail me the answers through my GC profile. If you can please upload one photo near the EarthCache.